You are here: Home > Homebirth midwives: birth is my hobby! Homebirth midwives: birth is my hobby! As I wrote in I am a special snowflake, dammit!, Barbara Herrera, Navelgazing Midwife, has unintentionally displayed the self referential character of natural childbirth advocacy, She demonstrated an inability to treat other women respectfully and the rather bizarre belief that when women make different childbirth choices, they are judging her and her specialness. I absolutely acknowledge the near-obsession with birth some of us have… the birth junky-ness of us. But, don’t *most* people have *something* that drives them? That is a place in their lives that creates a great deal of pleasure, whether doing or listening? Second, for natural childbirth advocates and general, and homebirth midwives in particular, birth is their hobby! For some, it’s collecting trains… others, talking about airplanes… and still others, it’s religion that’s the obsession. Might we not acknowledge that for some people (people like me!) that obsessive/constant/overwhelming passion has been and is birth? That if we *have* that drive within us, it isn’t *wrong*, but just different? For homebirth midwives, attending births is an activity pursued for pleasure and not an occupation. Since it’s a hobby, they see no reason to get bogged down with years of college and hours of in hospital training. A certification program is enough. After all, where’s the pleasure and relaxation in studying hard or learning about the prevention, diagnosis and management of complications when all you really want to do is catch babies? It’s kinda like fishing. 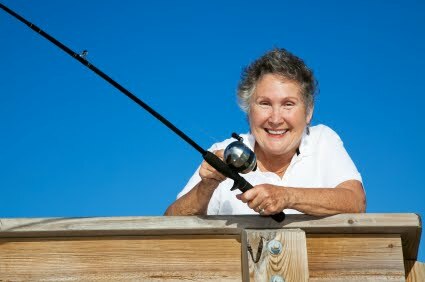 Fishing is an interest pursued for pleasure or relaxation. There’s no reason to get a degree in veterinary medicine just to catch a few fish, right? Why get a degree in midwifery (a real, college degree) just to catch a few babies? Here’s the problem: birth is serious and women giving birth deserved to be cared for by professionals. That’s because birth, unlike fishing, has a very real potential to end in the death of the baby or mother. It’s not about, nor should it be about a birth junky getting her fix. Homebirth (direct entry) midwives do all midwives a disservice by pretending that birth is a hobby. Midwifery is a profession, not an opportunity for voyeurism. Interestingly, the less training a homebirth midwife has, the more likely she is to refer to herself as a “granny midwife,” but that’s an insult to the real granny midwives of yore. Those women were not indulging their personal passion; they were providing medical care to the best of their ability. They attended births to prevent death, not to get their birth junky fix. They administered herbs because those were the best medicines they had at the time, not because they were “natural.” They delivered breech babies vaginally (and lost quite a few) because they had no other choice, not because they were “respecting the process.” They lamented their limitations, and tried to extend their knowledge; they didn’t glory in ignorance and pretend that knowledge was not worth the effort expended to learn it. Herrera inadvertently spoke the truth. Direct entry midwifery should be abolished because is nothing more than a hobby for women who love watching other women’s births. They refuse to acquire real training because they are too lazy, and can’t see the point if all they want to do it catch a few babies. Direct entry midwifery is by, about and for midwives. Patients exist merely to provide the fix. Direct entry midwifery is an insult to midwifery and to women. Midwifery, real midwifery, is about the needs of the mother and baby, not the needs of the midwife. It’s about providing safe care, anticipating emergencies and treating complications. It’s not about pretending that birth is safe, insisting that emergencies never occur and imagining that complications can be treated by dialing 911. American women and babies deserve real midwives, not hobbyists.